The path of total surrender unto the lotus feet of sriman nArAyaNan (also known as sharanAgathi) is a path that was told by perumAL sriman nArAyaNan Himself. Tamil poet thiruvaLLuvar says, “poRi vAyil aiyndhaviththAn poydhIr ozhukka neRi”. Here the words have to be understood as in “aiyndhaviththAn Agira iraivanAl sollapatta uNmayAna neRi ozhukka neRi” that means that it is God Who told about the path that is flawless and impeccable. thiruvaLLuvar in an another poem that starts with “paRRaRRAn paRRinai”, where he says “iraivan odhiya vIttu neRi”. This neRi is nothing but the path of total surrender (sharanAgathi). This act of totally surrendering oneself unto the lotus feet of sriman nArAyaNan has always to be done with the aid of one’s guru. One should learn the deeper meanings of sharanAgathi from one’s guru. Those who do so and gain undisputed belief in it, would reach the eternal abode of paramapadham and do uninterrupted kainkaryam there. vaigunthaththu eternal abode known as “srivaikuntam” or “paramapadham”. 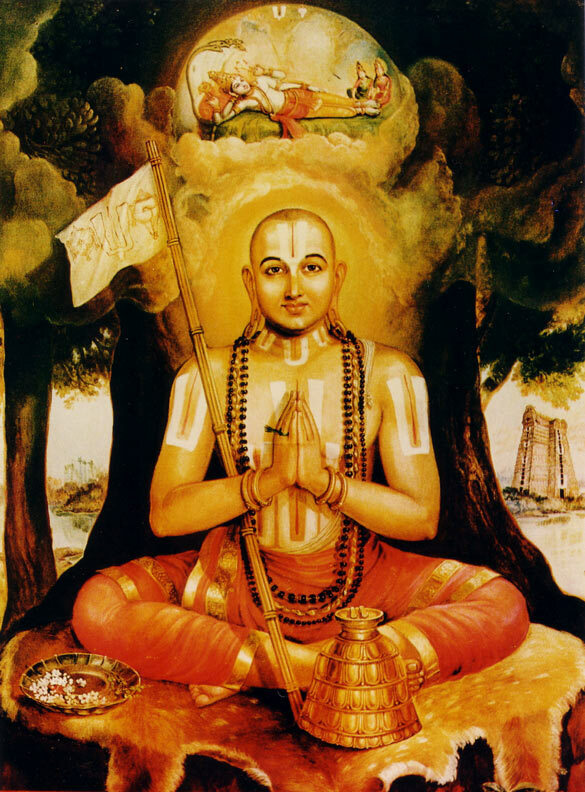 thappil guru aruLAl: “thappil guru” would refer to a guru who does not do anything wrong ever. As per the thirukuRaL phrase “kaRka adhaRku thaga niRka”, the fact that the guru does not do anything wrong is a result of the knowledge he had gained earlier. oppil adigaL: This refers to the “incomparable lotus feet” of sriman nArayaNan, that covers the meanings impregnated with the word “charanau” in dwaya mahA manthram. The reason HIS lotus feet is often described as “incomparable” is because of the ability to protect any devotee without seeking the help of something else. namakku uLLaththu -vaippenRu: This refers to devotees like us. In order to be the recipient of HIS grace, there is no other refuge for anyone. As per the universal truth, there is indeed no other way except HIMSELF. Thus, “us” includes all of us who have realized this truth and this group of people is what is being described by the phrase “namakku”. Such devotees who have HIS lotus feet in their heart, consider it to be their “savings deposit” / “treasure”. Thus, the phrases in “charanau” and “prapadhyE” in dwaya mahA manthram is being referred by this. The reasons is as follows: If a person has a treasure, he can do anything that he wants. Likewise, if a person has in himself, the divine lotus feet of sriman nArayaNan, he can accomplish anything that he wants because he can meditate upon the Lord by thinking “HIS lotus feet alone is my sole refuge”. Hence, the comparison of HIS lotus feet to a treasure is perfectly fine. Moreover, when we say to catch hold of HIS lotus feet, it is a mental act and not a physical act. This is often times being called as “mAnasa swIkAram” and so is an act of mind rather than a physical act. thERi iruppArgaL: Those who are unshakable in their belief about HIS lotus feet in their hearts. It is interesting to note that even though one may seek HIS lotus feet as their sole refuge and worship in their hearts. However, in order to have an unshakable belief in it is not an easy task. Thus, “thERi iruppArgal” includes those group of people who are steadfast in this belief. To a person who has done sharanAgathi, this belief is of utmost interest. If ever there is a lapse in this belief, then he cannot go to paramapadham. To such persons who has this certain belief, the gain of such a belief is being described in the ensuing lines. thEsu poli vaigunthaththu: They would reach the final destination of ever resplendent “paramapadham” that is being described as “azhivil vIdu“. In paramapadham, one can experience the highest bliss and can do service forever that would please sriman nArayaNan. ERi iruppAr paNigatkE Eyndhu: These devotees would be suited and be ready to do service at paramapadham. “paNigal” refers to services done to sriman nArayaNan. “Eyndhu iruppAr” is being ready / qualified to do such a service to the highest sriman nArayaNan. There is yet another meaning if we take the second meaning of “paNi”. “paNi” can refer to “AdhisEsha” and so would mean here that these devotees would be comparable to Aadisesha. This means that just like how AdhisEsha does eternal service to sriman nArayaNan, the devotees will also be able to do it. The services that Aadisesha does are being beautifully described in “senRAl kudayAm, irundhAl singAsanamAm, ninRAl maravadiyAm, nIL kadaluL enRum punaiyAm maNi viLakkAm, pUmpattAm, pulgum aNaiyAm thirumArkku aravu”. This entry was posted in gyAna sAram, Other on February 6, 2015 by santhanam rajagopalan.